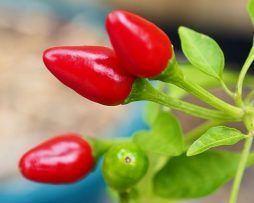 A stunning, eye catching variety of chilli that is super prolific to boot. 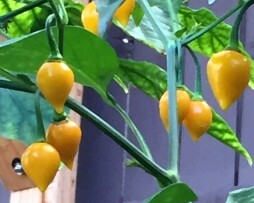 The Numex Twilight Chilli produces 2cm upright pods with a medium-hot flavour. 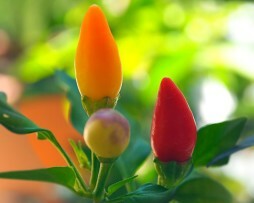 The colourful chillies ripen through a rainbow of colours as they mature from white to purple to yellow to orange to red. 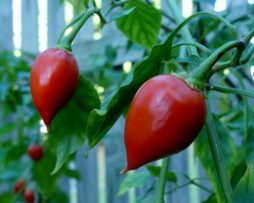 This variety was developed at the New Mexico State University, (which creates all “NuMex” varieties of plants). It grows quite compact and is ideal for small pots to brighten up the patio or veranda. The Padron is quite obviously from Spain. Nearly everyone will know the name. 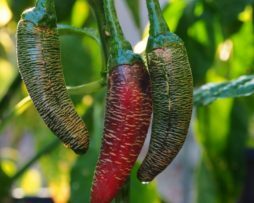 It may well be the most well known pepper in the Mediterranean area. These are used all the time in Tapas and while not usually all that hot, for some reason there can be one that will light your fire! They are usually picked and eaten green, unlike our picture! They are probably one of the World’s best “frying peppers”. If you have not tried these sautéed in olive oil and salt, you are really missing out. Once the Padron passes your lips you will be hooked. It is a ‘must grow’ for us and hopefully you too. 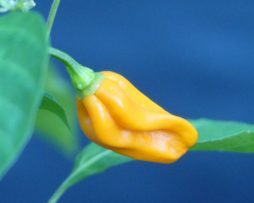 Prik Chi Faa is an heirloom pepper from Thailand and well regarded as one of the “go to” types for Thai and Asian cooking in general. It is regarded as medium hot so it will give your stir fry a good whack of heat without scaring off the kids. 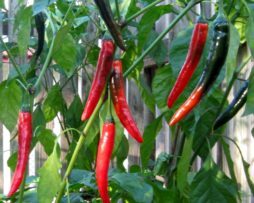 Used in all soups, stir fries and curries either fresh or dried it will become one of your most used chillies. Fast growing and a great producer, Prik Chi Faa will keep you smiling at the dining table!